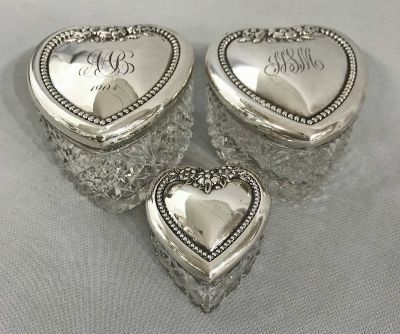 Edwardian era sterling silver and crystal heart shape vanity jars. Made by Roden Brothers Ltd., Toronto, circa 1900-1910. Sterling silver lids on cut crystal jars. The two larger jars are 3 1/4” in diameter, 2 1/2” high. The jar on the left is engraved AAB 1904. The jar on the right is engraved NSM. The smaller jar is 2 1/8” in diameter, 1 1/2” high.